While installing got another error with some missing dependencies… The PDT Core Unit Tests was missing bundle org.eclipse.dltk.core.tests 0.0.0. The package name ending with 0.0.0 doesn’t seem right but it was solved by just installing PDT and not the Unit Tests package. I wasn’t really planning to use this package but it’s always nice to know I couldn’t even if I wanted to :-). Well it actually didn’t make much sense to me. Why would I need to add PHP support to a PHP project. If anything should already have PHP support, it should be a PHP project. But I didn’t have any other lead so I just did it. It updated the project file. And there it was, I was then able to select a PHP file to debug !! After Oracle releasing security updates for Java version 6 and 7, now Apple is following and distributes Java for Mac OS X 2012-005 moving to version 1.6.0_35, and thus the necessary corrections to its own OS X implementation. Moreover, the Safari plugin is configured so that it is automatically disabled when no applets are run a long time. If you want to re-enable Java, you have to do this via the plugin settings. The update “Java for Mac OS X 2012-005” requires Mac OS X 10.7.4 or Mac OS X 10.8.1 while “Java for Mac OS X 10.6 Update 10” requires Mac OS X 10.6.8. Both updates improve the security, reliability and compatibility of Java SE 6 (by updating it to version 1.6.0_35). Before installing the update, all web browsers and Java programs that are running must be closed. Starting with version 7.0, Oracle will take care of the deployment of Java for Mac OS X. The latest Java 7 version for the Mac (a developer version) is available on this web page for download. I wanted to install the EGit plugin in eclipse and couldn’t connect to the marketplace. So I checked the proxy settings in Window / Preferences / General / Network Connections. It was set by default to Native. My understanding is that Native means to use the settings of the OS. I’m running Windows 7 64 bits. Somehow no connection was possible. So I changed it to Manual and manually entered the proxy hostname and port in all three entries. This didn’t work either. I’ll still release the binaries here but will not provide a ZIP file with the source code anymore as anybody can download it from github. 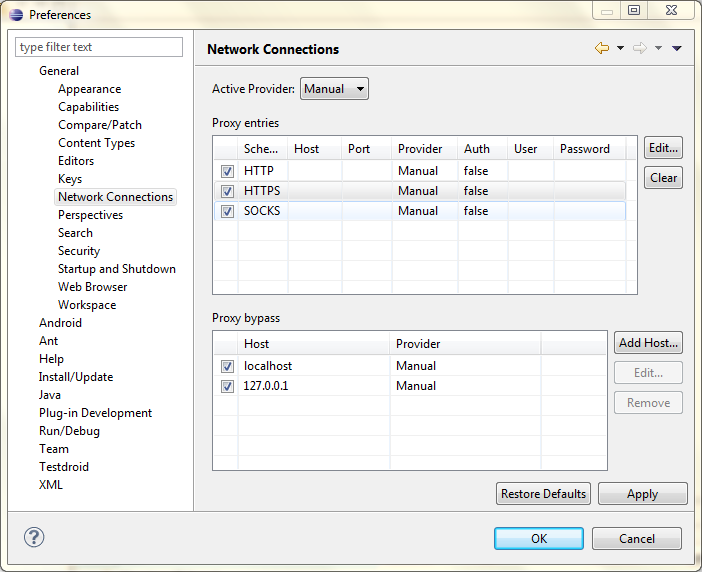 In the first part, we’ve seen how to get general information about the ESX hosts. In the second part, we’ve read some information about the virtual machines running on a given host. In this part, we’ll get started with performance counters. Your ESX system collects data at runtime about performance for all aspects of the system—CPU, disk, memory, network, and so on. The data in the counters is accessible through the PerformanceManager class. String perfCounterString = perfCounterInfo.getNameInfo().getLabel() + " (" + perfCounterInfo.getGroupInfo().getKey() + ") in "
perfCounterInfo.getKey() returns the key with which you can identify the counter to get some information about the performance of the system. where SELECTED_COUNTER_ID is a constant we’ve define containing the counter ID we want to retrieve (e.g. 25). This will return the greatest available level of detail (i.e. 20 seconds). In this part, we’ll read some information about the virtual machines running on a given host. Note: if you use si.getRootFolder() instead of host you will get all VMs running on all hosts managed by your ESX infrastructure. The version 1.3 of SybaseBuddy can be downloaded here. Please note that the new tabs (like multiple other already available tabs use columns of system tables only available in Sybase 15 and above). If run against Sybase 12.5 and lower, they will fail.